An ugly clash took place between two groups outside the main entrance of Gujranwala Guru Nanak (GGN) Khalsa College here today. Seven students have been rounded up for questioning by the police in this regard. 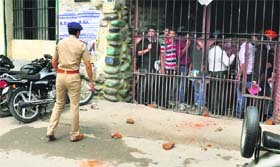 Tension prevailed in the Central Jail on Tajpur Road here today when nearly 250 inmates staged a dharna and demanded action against Deputy Jail Superintendent KS Cheema. Left with no option, furnace associations will resume work from tomorrow. The associations were on an indefinite strike against the new e-trip system started by the Excise and Taxation Department. Getting high-security number plates for new vehicles or the existing vehicles has become a virtual headache for the public. Even after a wait of more than four months, owners of vehicles have not been issued these number plates by the contractor entrusted with the task by the state government. Twenty new child labour schools will be opened in the district during the next three months. There are already 20 such schools being run in the district. Child labour has been a cause of concern, especially Ludhiana, the industrial capital of Punjab. Hundreds of children are often seen working in dhabas and commercial establishments. 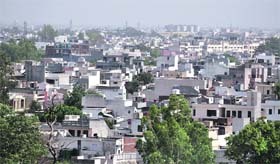 Despite a government policy in place for the grant of a no-objection certificate (NOC) for the installation of mobile towers in non-residential areas and provisions for the regularisation of towers put up without taking prior approval or payment of the stipulated fee, as far as the Ludhiana Improvement Trust (LIT) authorities are concerned, not a single mobile service provider has obtained permission for the erection of mobile towers nor has any such structure been regularised till date. 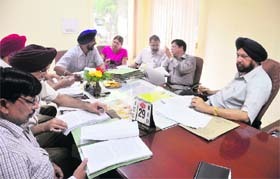 As the term of present Ludhiana Municipal Corporation (MC) House is set to end on September 6, the Finance and Contract Committee (F&CC) meeting of the civic body was finally held today. The meeting could be dubbed as the last F&CC meeting before newly elected councillors are administered oath. Atam Nagar MLA and a member of the Finance and Contract Committee (F&CC), Simarjit Singh Bains, has alleged that he was not invited to attend the two F&CC meetings held after the Vidhan Sabha elections. He even alleged that leave aside informing him about the meetings, he was not even sent the agenda for these meetings. The inauguration of a newly installed tube well in the Vishwakarma Colony area falling under ward number 14 of the city has become a bone of contention between the Congress and Shiromani Akali Dal (Badal)-Bharatiya Janta Party (SAD-BJP) leaders. 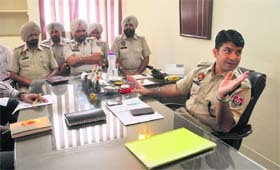 The Ludhiana Municipal Corporation (MC) has finally come out of slumber and has realised that the safety of fire brigade officials is also important. That is why the civic body is all set to upgrade its ailing fire brigade department. In today’s Finance and Contract Committee (F&CC) meeting, it was decided that four new fire tenders would be purchased, besides the existing two will be repaired fully. 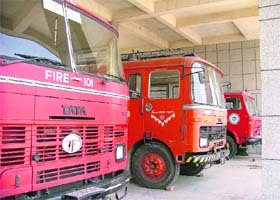 A file photo of the municipal corporation’s fire engines in Ludhiana. City residents should get ready to pay property tax on their residential properties. After the state cabinet announced that the city residents will now have to pay property tax, the process to come up with a formula for calculating the tax has already started. The Congress workers from the Atam Nagar Assembly Constituency, under the leadership of the party MLA Bharat Bhushan Ashu and senior Congress leader KK Bawa, conducted a "brain surgery" on the effigies of Punjab Chief Minister Parkash Singh Badal and Deputy Chief Minister Sukhbir Singh Badal as a mark of protest against the new taxes introduced by the ruling SAD-BJP alliance government in Punjab. The hike in luxury tax from 4 per cent to to 8 per cent has not gone down well with the hotel industry in the city. In addition to this, 0.5 per cent hike in VAT on certain items has also not been well received by the city people. Much to the relief of common man, VAT imposed on sugar has been rolled back by the state government. Homemakers are happy that their kitchen budget will not be disturbed due to VAT imposed on sugar. VAT at the rate of 5 per cent was levied on sugar from July 25 and not only traders but consumers were also unhappy over the imposition. A meeting between the members of Advisory Committees from different departments, chaired by ADC (D) Rishipal Singh, was held at the Circuit House to discuss the implementation of various schemes being run by the government for the benefit the scheduled castes, backward castes, widows and disabled. Today's fight at GGN Khalsa College was just one of the many problems the residents of Dr Sham Singh Road are facing due to being in close vicinity of the college. 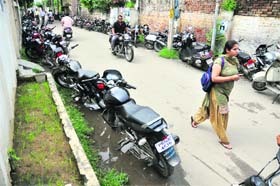 The parking of vehicle by students of GGN Khalsa College is proving to be a nightmare for residents of Dr Sham Singh Road. The traffic police has devised new plans to get rid of the bottlenecks that are causing nightmare to the commuters in the city. They have come with a three phase programme to tackle the traffic problems. On the occasion of National Sports Day, youngsters and sports enthusiasts in the city pulled a wry face due to little sports infrastructure the city has to offer. Performance of players has been plumbing new depths and the poor sports facilities that the city has to offer only epitomises the poor condition of sports across the state, say youths of the city. The sports wing of the Education Department will be computerised to bring transparency in selection procedure for school games. Earlier, the department had been facing criticism from coaches, who had charged the department officials of changing the names of players from the list of selected players to favour their near and dear ones. An 11-member delegation from Nigeria had visited the Central Institute of Post Harvest Engineering and Technology (CIPHET) here today. They were here to explore areas for cooperation in post harvest sector. Shruti Singh Choudhry, Deputy Commissioner of Shaheed Bhagat Singh Nagar, has been appointed as the Chief Administrator of the Greater Ludhiana Area Development Authority (GLADA). She will also hold the additional charge of the Administrator of Ludhiana Improvement Trust (LIT). A man under the influence of liquor stabbed his wife after she refused to give him money, so that he could buy liquor. The victim, identified as Rekha, was rushed to the Civil Hospital where her condition was stated to be serious. Barely two days after the bursting of a carjacking gang, yet another carjacking gang struck again and fled with a Hyundai Verna from 21-year-old Eraaz Oswal while he was travelling on the Ferozepur road. BVM, Kitchlu Nagar, won the U-14, U-17 and U-19 Boys’ Inter-School District Sqay Martial Arts Championship with nine gold, four silver and three bronze medals organised by the district education department held at BVM, Kitchlu Nagar, today. 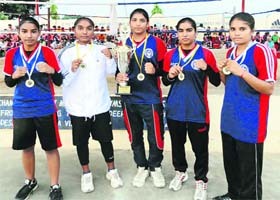 Continuing their good performance in various national and state-level championships, pugilists of Sher-e-Punjab Sports Academy, Chakar, near Jagraon, added yet another feather in the cap of the academy by emerging the overall champion at the 8th Punjab State Junior Boxing Championship for Women.